Everybody appreciates the benefits that come with a high-quality and new mattress, but the financial investment that you have to make to buy one is quite significant. There is also the notion that your old mattress still has some life left in it. A cooling pad provides the perfect solution for both because you will not have to get rid of your old one and neither do you have to spend a fortune. But, there are many brands and types available in the market, and so you have to know how to choose the best cooling mattress pad or cooling mattress topper. Sleep Master from Zinus is one of the best investments that you can make because it will guarantee you a relaxed and comfortable sleep. The two-inch thickness is as comfortable as it can get and the foam is also perfect for all sleeping positions. Size: The two inches size of this memory foam is just perfect, and this is one of the things that make it an excellent choice. I have used others that are up to four inches but using this one proves that two-inch thickness is ideal for anyone looking for comfortable and safe sleep. Material: Having tried out toppers with different materials I must admit that foam is the best of them all. The others were too expensive, and their comfort did not match their price. However, with this one, I am sure of reliable performance and unmatched durability. Portability: One of the biggest issues that I have with toppers is transporting them because most get ruined when you fold. 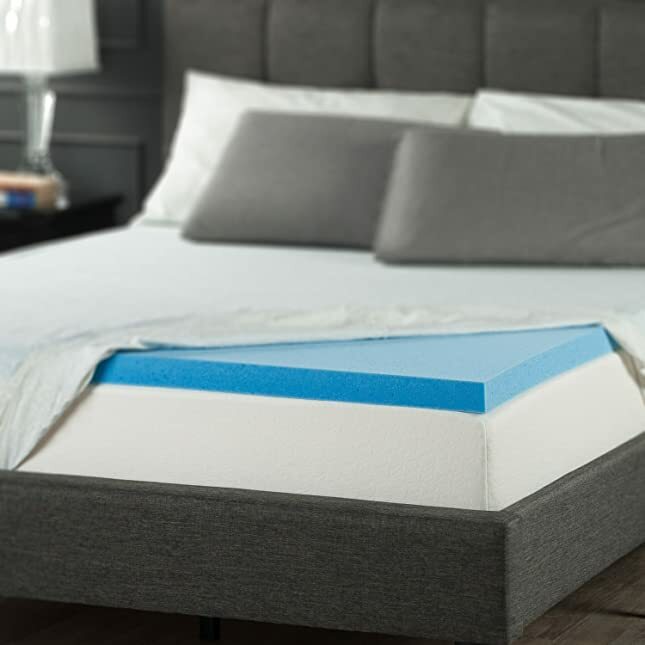 However, this is not the case with this memory foam from Zinus because it uses a patented technology that allows it to compress into a small size without affecting its quality. Temperature Control: Having used this topper for a long time, I can tell you with certainty that the gel will make your mattress cooler to ensure that you sleep like a king. Softness and firmness of the memory foam will help alleviate hip and back problems. The materials also contribute to getting rid of odors. Ventilated design makes it perfect for any sleeping position. Zinus gel memory foam mattress topper is very effective in relieving stress. Does not need a cover because it can fit any standard size bed sheet. Top notch quality and affordable price guarantee you satisfaction. Some people may find it too firm. It does not fit some mattresses sizes. The colors are quite dull and unattractive. This memory foam will not eliminate the need to replace an old mattress. The enhanced comfort in this design means that you will always wake up feeling energized and relaxed. It is also top notch quality to ensure you use it for a long time and it comes with an open cell structure for unmatched airflow and breathability. Extra Comfort: There are many toppers out there but what I like about this one is that the manufacturer goes to a great extent to enhance its comfort. When I was trying it out, I found out that immediately you put your weight on in there is an almost instant relaxation of the muscles and relief of the pressure points. And this is one of the things that make it perfect for restless people. Open Cell Structure: If you are looking for something cozy and cool, then this topper is what you need to buy. I noticed that the topper uses an open cell structure design with an integrated gel layer that increases air flow tremendously for a cozy and refreshing sleep. Odorless: Most toppers will claim to be odorless, but they always have a particular smell, but this is not the case with this one. I like the fact that it does not absorb the smell of sweat, and this is regardless of how long you use it. Certification: I love products that not only think of the customer but also about protecting the environment. 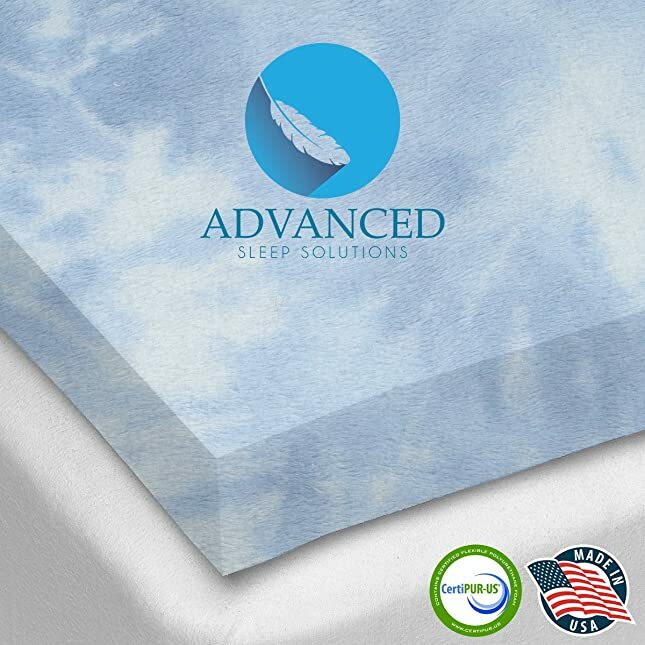 Advanced Sleep Solutions is CertiPUR-US meaning that it does not contain anything that may harm you or the environment. It guarantees you maximum airflow and breathability. You sleep all night comfortably without having to keep on turning. This topper is perfect for people with allergies. The memory foam dissipates heat up to three times faster than traditional gel memory foams. Sheets fit perfectly, and they will not come out. All the materials that make this topper are environment-friendly. A few people do not seem to like the color. It is heavier than what most expect. This topper might be too soft for others. Sometimes it might slide off the mattress. Chilipad PLS uses modern technology that entails fitting some coils on the pad to help you regulate the temperature of your bed. With this pad, you can choose to either warm or cool your bed, and it does not consume a lot of energy. Modern Technology: If you are willing to make the investment on a current pad that uses advanced technology then Chilipad PLS is a perfect buy. It will set you back more than a thousand dollars for your California king size. But, having used it a few times, I can tell you that it is worth it. The technology uses some leak proof coils that are on the pad to circulate water that cools or heats your bed. Temperature Range: The regular pads that I have tried out will not give you the freedom to choose a particular temperature. However, with this one I love the fact that you can choose the temperature you want between 55-110 degrees. Size: Even with all the advanced technology I like the fact that it is available for almost all bed sizes. The best thing is that the prices also vary according to your bed size. Energy Consumption: At first I thought that buying this pad will be another addition to my energy bill, but I was very wrong. The wattage is as low as it can get and the fact that I do not have to heat the entire house when using it means that I save some cash on my energy bill while still enjoying a comfortable sleep. Fits standard and extra thick mattresses. Gives you freedom to control the temperature at the touch of a button. You can choose to cool or warm your bed. Saves you money on your energy bill. With this pad, you fall asleep faster and also get a deep sleep. Temperature adjustment is very easy. It might take long to get used to the tubes. Fans on the unit are quite loud. The lights are also ravishing. Replacement parts are not easy to come by if the unit breaks down. A mattress protector like the Ultra Luxe will not only prevent your mattress from staining, but it has a cooling effect that helps you get excellent sleep. It is also hypoallergenic, and so you can be confident that there will be no bacteria, dust mites, and allergens on your bed. Waterproof: I know how stains can be annoying on your mattress, and the worst thing is that they make the warranty void. However, with this cover, you will never have to worry about this because it is 100% waterproof. Hypoallergenic: Being a very allergic person am always keen on where I sleep and the products that I buy. The Ultra Luxe from Coop Home Goods ranks high on the list of my best sleep products, and this is because it protects the mattress against bacteria, allergens, and dust mites. Easy Care: I hate it when I have to clean mattress pads because most do not make it easy. And this is why I love Ultra Luxe mattress protector because you can wash it using a machine making its maintenance almost effortless. 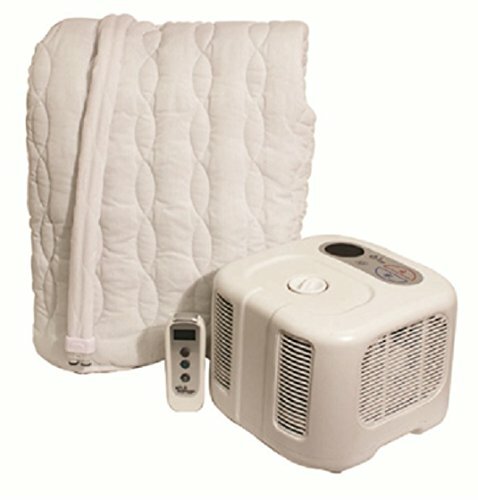 Ultra-Tech Cooling: The bamboo and polyester ultra-tech cooling will help keep you comfortable at night when sleeping. It might not make you as cool as others, but I love the fact that you get to sleep very comfortably. It has a cooling effect on your body. The cover is plush and also environment-friendly. Full sized design means it can protect even 18-inch thick mattresses. The design is light and very easy to install. It is machine washable for easy maintenance. Ultra Luxe has a non-slip and snug fit. This protector is quite thin. It fits loosely on most beds. Ultra Luxe may not be as cooling as most customers hope. It tends to bunch up and slide to one side. The days that one had to withstand very cold or warm nights are long gone because advances in technology make devices like the BedJet V2 exist. What I love most about this device is that it can heat or cool each half of the bed independently, and it does either in a few seconds. Dual Zone Temperature: My husband loves to sleep on a warm bed but I prefer mine to be cool, and so a device like the BedJet V2 is a gift from heaven because it makes this possible. It uses dual temperature technology to give each half of the bed individualistic cooling or warming. Safety: I hate wires and having electricity in my bed because they are not safe. However, the V2 does not have any wires or tubes and no electricity running through your bed, and this ensures that you sleep safely and comfortably. Powered Ventilation: You will never have to worry about hot flashes or night sweats when using this device because of the powered ventilation cooling. I also noticed that this system is very helpful with stuffy bedrooms as it has a unique effect that makes the air smell fresh and clean. Instant Effect: Most people with me included hate having to wait for several minutes for the bed to cool or heat. 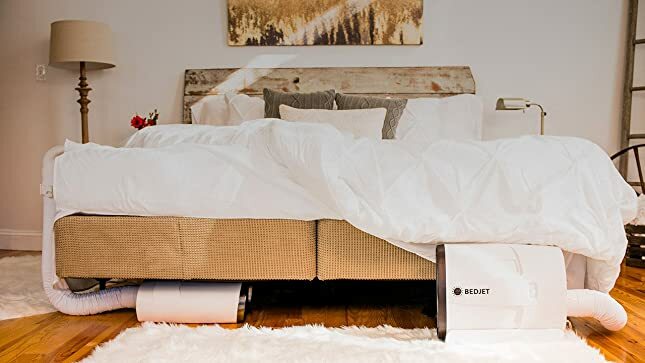 With the BedJet V2, you will never have to wait because it can warm or cool the bed in a matter of seconds. Allows for Independent cooling or heating for couples. This system has a robust construction to ensure durability. You can control temperature with a remote or use an app. Works for any type or size of bed. Cools or warms the bed instantly. The base unit is too tall and bulky for some beds. It is an expensive system. The fan is loud when the machine is in operation. This device will shut down at random times. A cooling pad is simply a small cushion with a unique material that will help regulate the temperature in your bed to ensure that you get a comfortable and peaceful sleep. It is between one and three inches in thickness, and you only have to place it on top of your regular mattress. The benefits of this small pad include the following and many others. Even if you do not have enough cash to buy the waterbed that doctors and chiropractors recommend there are still other options, and the cooling mattress pad tops the list. It is very effective in reducing pressure, and it will only cost a fraction of the price of a waterbed. Most cooling pads or topper do not have any filler that emits odors and other toxic substances that may not only affect your sleep but is also harmful to your health. And so these pads will guarantee you a peaceful and safe sleep. 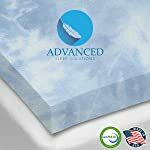 Ability to dissipate heat is one of the main benefits of a cooling mattress topper and also one of the primary reasons that most people will buy it. They use cool gel technology to get rid of heat from different parts of the body to help you get a peaceful sleep. If your old mattress is too soft or stiff then a cooling pad can come in handy. The materials used to make the pads are not just for cooling, but they also add comfort. And so by buying a cooling pad you can be able to make your mattress comfortable for many years. If you buy the best cooling mattress pad it will serve you for long, and this is on top of making you feel comfortable when sleeping. And this means that they can be useful in extending the life of your mattress or helping you postpone the need to replace it for some years. Dust mites can be annoying, and they can also make you sick. However, before you throw out your expensive mattress to get rid of them, you should first try a mattress pad. These pads are very useful in guarding you against dust mite and in most cases they might be all the solution that you need. The options are endless when it comes to choosing a cooling mattress pad because many companies produce them. And so if you do not have the right information you may end up buying something that will not serve you as you had hoped for or not last for long. However, choosing the best cooling mattress pad should not be difficult because you only need to consider the following important things. The material is the most important aspect that you have to consider when choosing a cooling pad because it is what determines how good it will serve you. There are many options to choose from, and the most common ones are wool, latex, and cotton. Cotton is thinner than the others, but it is washable while latex and wool are mold and mite resistant. Natural latex is very durable while wool is perfect in the warmer month because it will help keep you cool thanks to its high absorbency. Contrary to what most people tend to assume height does matter a lot when it comes to shopping for a mattress pad. The sizes range between one and three inches, but it is still not uncommon to find some that are smaller or larger than this range slightly. A thick pad has a lot of foam, and so it will conform to the body better than a thin one and hence making it very comfortable. Modern cooling pads come with some extra features, and they are also important to consider when shopping for one. Some of these additional features include hypoallergenic and odor-elimination. The more the extra features on a pad, the better because it will mean that you will get to enjoy more benefits when using it. Motion transfer is another impressive extra feature, and this is more so if you are sharing the bed with someone else because it helps to ensure that their movements when in bed do not interfere with your sleep. A pad may not be as expensive as a full-size latex mattress, but it will still cost some money, and so you have to consider the price and your budget before buying one. They come in different price ranges that will depend on the brand and also on quality. However, one should be very careful with those that are very cheap because they will also not last for long. Mattress pads also require maintenance, and so it is important to consider the ease of caring and cleaning before buying one. The thin cotton ones are easy to clean because they are washable, but there are still several other ways of cleaning the other materials. And so you should only choose something that you can care for comfortably. You do not have to struggle with getting a good sleep because your old mattress is too warm. The cooling mattress pad will help provide you with an ideal sleeping temperature, and it does not cost as much as replacing your mattress. However, to ensure that you benefit from this and all the other advantages of the pad you should only buy the best that there is by considering the six factors above.